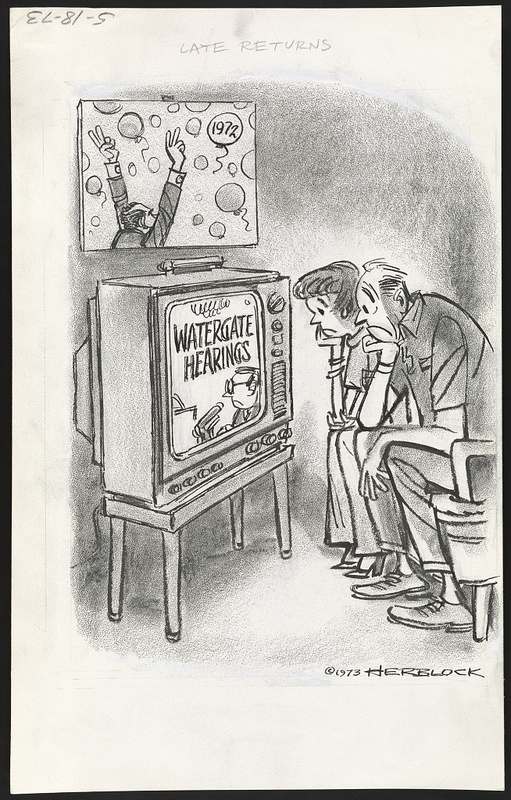 The Watergate coverage is significant, not only insofar as the hearings themselves are significant, but also as a great moment in public television history. 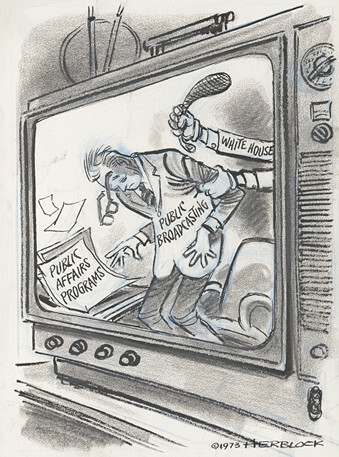 In the years preceding the coverage, pressure from the Nixon Administration had put in question whether public television should carry public affairs programs at all. The Watergate coverage answered that question with a definitive ‘yes’. In the years before C-SPAN, no network had ever broadcast full hearings “gavel-to-gavel” in prime time before. 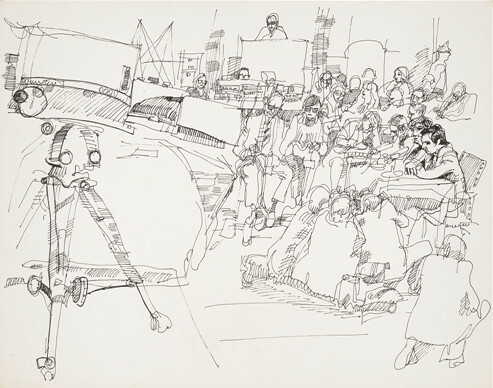 This format, which allowed viewers to draw their own conclusions from the evidence, expanded public television’s viewership by orders of magnitude. For a summer, viewers were glued to their screens, often past midnight, watching such personalities as Sam Ervin, Howard Baker, John Dean, and John Ehrlichman discuss what increasingly became a constitutional crisis. 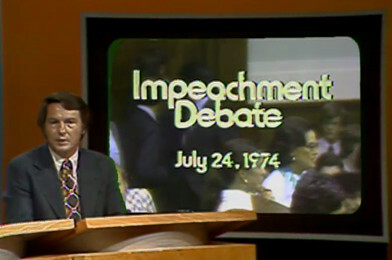 The broadcasts were so successful that public broadcasting continued to use the format for future political events, including the House impeachment inquiry a few months later. They also launched the partnership of anchors Robert MacNeil and Jim Lehrer who would go on to host the program that today is called the PBS NewsHour. To learn more about the substantial impact Watergate had on the history of public broadcasting, please see the following essay. To jump past the background to a discussion of the coverage itself, click “Gavel-to-Gavel”: The Senate Hearings Open on Public Television in the “jump to” section. This story, like most historical fables, becomes more complex under examination. What remains clear is that NPACT’s coverage of the hearings was an unmitigated success for public broadcasting. 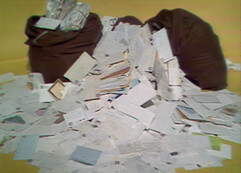 Letters, phone calls, personal checks, and newspaper clippings from around the country flooded national and local offices praising the coverage. Men and women who had barely heard of public television before 1973 devoted evening after evening to hours in front of their TVs. 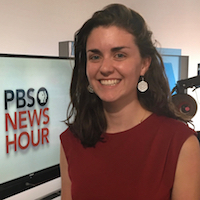 The hearings solidified public television’s place in news programming, laying the groundwork for The MacNeil/Lehrer Report, later the PBS NewsHour. 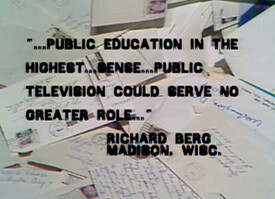 Some have claimed that the coverage saved public television altogether.4 Others have seen the Watergate affair as a “Pyrrhic victory” that left the fundamental problems in public broadcasting unresolved.5 The following essay will tell the story of the Nixon Administration and public broadcasting and examine the impact of the Senate Watergate and the House impeachment hearings on public television. Throughout Nixon’s Presidency, Whitehead became the nemesis of many in the public broadcasting world. One commentator complained, “It's kind of too bad Clay Whitehead wasn't implicated in the Watergate scandal.”25 However, he never sought to eliminate public television. Others in the White House were not so politic. While many like Whitehead pursued a theoretical debate about the right balance between local and national funding, between insulation from politics and accountability to the taxpayers, there was also “the [Charles] Colson — [H. R.] Haldeman antagonism that saw the CPB programming as politically active and hostile.”26 On the more extreme end, Pat Buchanan could be counted on to say, “Wrong thing for the government to fund. We’ve got to zero it out, and that’s that.”27 It became Whitehead’s task to find a solution to the Administration’s unchosen obligation of public broadcasting, without appearing to be motivated by partisan interests. 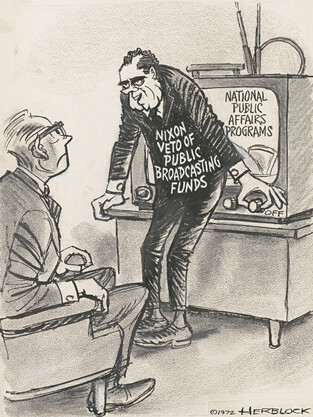 With this plan to create a favorable board, the Nixon Administration began to directly influence the public broadcasting system. On June 18, 1971, Whitehead and Antonin Scalia, then a legal consultant to OTP, began a “Memorandum for the President” suggesting that the Administration focus on establishing “structures and counterbalances” that would restrain the tendency of the Corporation to support liberal causes and that would “be difficult for other administrations to alter.” They suggested replacing CPB President John W. Macy, Jr. with an “apolitical” leader, giving more money to local stations, and putting further pressure on the CPB to shrink NET.33 On September 23, 1971, the same day that Whitehead, Scalia, and their team completed their memo, NPACT announced the hiring of Robert MacNeil and Sander Vanocur to do a weekly political program. According to Jon M. Huntsman, Staff Secretary to President Nixon, the announcement “greatly disturbed the President who considered this the last straw. It was requested that all funds for Public Broadcasting be cut immediately.”34 Nixon considered Vanocur to be a “well-known Kennedy sympathizer” who had contributed to his loss to John F. Kennedy in 1960.35 Whitehead and his team rushed to warn their higher ups of the dangers of interference in a purportedly independent system. One of Haldeman’s aides wrote in a memo discouraging the cessation of funding for public broadcasting, “Believe me, I do not enjoy watching these left-wingers any more than you do, but I think it is essential that we know the maximum that can be done and do it rather than spinning our wheels proposing the impossible.”36 Whitehead advised that any substantial action would “raise a loud Liberal howl,” but if Nixon was willing to risk the controversy, he would “open the attack” in his address to an upcoming convention of local station representatives.37 Nixon’s staff opted for action. Herbert Block. “I’ll Tell You Everything You Need to Know.” Prints and Photographs Division, Library of Congress. LC-DIG-hlb-08002. 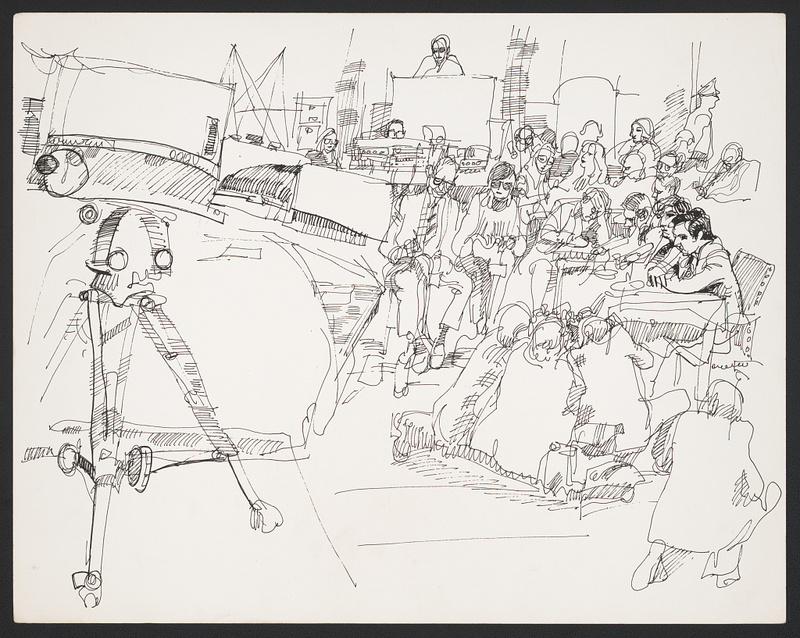 A 1972 Herblock Cartoon, © The Herb Block Foundation. 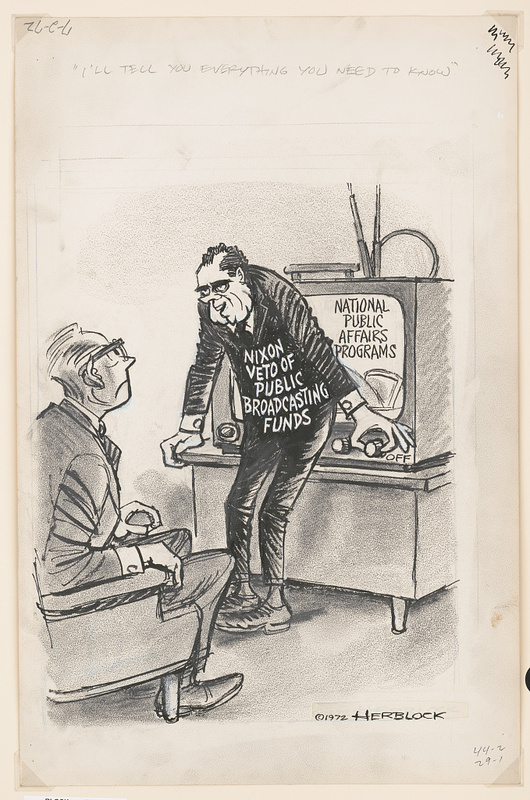 In early 1972, the CPB board, now with a majority of Nixon appointees, decided to limit funding to public affairs programs. 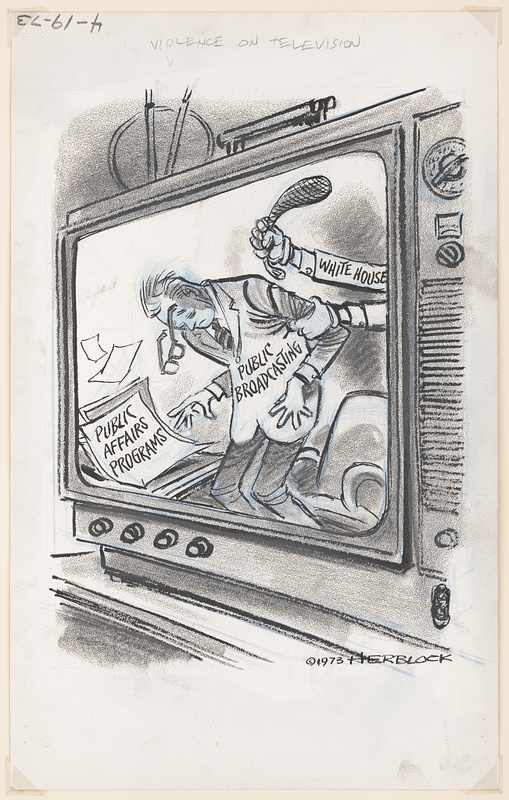 As a result of the cuts, NPACT had to scrap grand plans to cover the 1972 election.48 On February 20, 1972, the ACLU released a report that accused the Administration of trying to “intimidate” and “starve” public broadcasting.49 In an implicit rebuttal, Whitehead sent a letter to Congressman Robert Michel on April 28 indicating that the Administration would support a $45 million bill, a modest increase in funding from $35 million in the previous year. He stated that OTP would not add more until public broadcasting restructured itself and the overall budget looked more favorable. Herbert Block. Violence on Television. Prints and Photographs Division, Library of Congress. LC-DIG-hlb-08205. 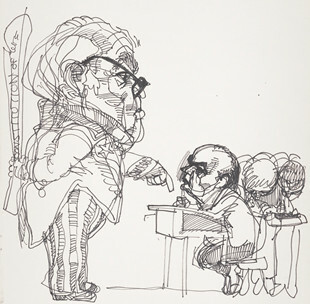 A 1973 Herblock Cartoon, © The Herb Block Foundation. Herbert Block. Late Returns. Prints and Photographs Division, Library of Congress. LC-DIG-hlb-08225. 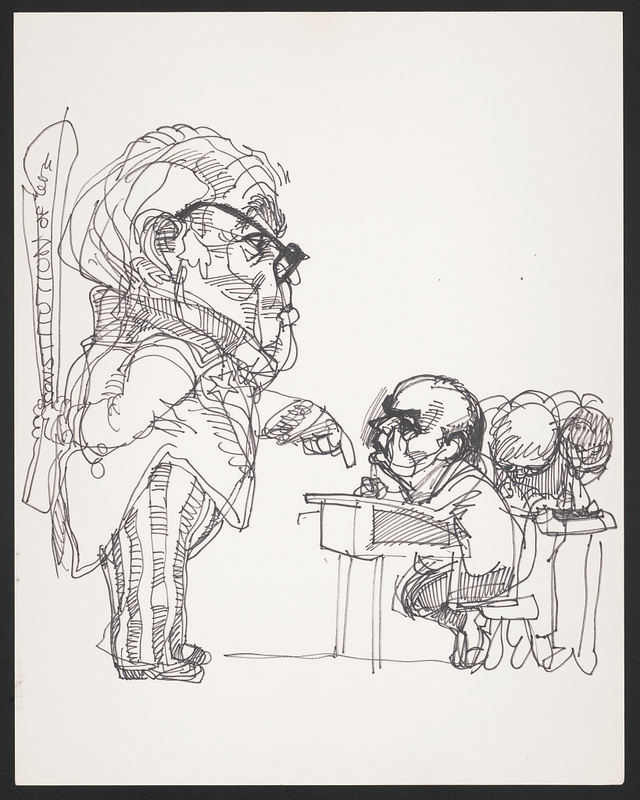 A 1973 Herblock Cartoon, © The Herb Block Foundation.  In the Senate of the United States, a Resolution: To establish a select committee of the Senate to conduct an investigation and study of the extent, if any, to which illegal, improper, or unethical activities were engaged in by any persons, acting individually or in combination with others, in the presidential elections of 1972, or any campaign, canvas, or other activity related to it. We are running it all each day because we think these hearings are important and because we think it is important that you get a chance to see the whole thing and make your own judgments. Some nights, we may be in competition with a late, late movie. We are doing this as an experiment, temporarily abandoning our ability to edit, to give you the whole story, however many hours it may take. One imagines that MacNeil and Lehrer signed off that night not knowing whether anyone at all had watched. As it turned out, they needn’t have worried. 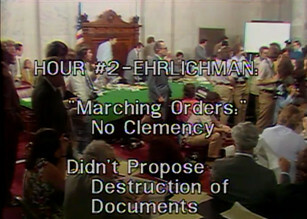 What made the hearings so appealing to such a wide viewership, many of whom had never seen a program on public television before?103 Top reasons include an enthralling cast of characters, the chance to interact with politics in an unmediated fashion, and the dramatic developments for the future of their country. Joseph Papin. Constitution of we? 1973. Prints and Photographs Division, Library of Congress. LC-DIG-ppmsca-53336. Joseph Papin. [Witness (Reisner?) testifies], 1973. Prints and Photographs Division, Library of Congress. LC-DIG-ppmsca-53339. The proceedings revealed capers that were, as MacNeil and Lehrer were fond of pointing out, the “stuff of spy novels.” On May 22, burglar James McCord demonstrated how to bug a telephone, while on September 25, Hunt showed how to photographically steal documents. The audience could track an ever expanding list of code names, including Gemstone, Ruby, Crystal, Sedan Chair II, and Fat Jack. They heard stories of secret midnight phone calls from mysterious men, cash payments in laundry bags, and any number of “dirty tricks” and “White House horrors.” These stories only continued to expand and multiply as the Committee uncovered the depth and perplexing diversity of the Administration’s crimes. It reminds one of the finals scenes of one of those Shakespearean histories. The forces hostile to the king are rising on all sides. Messenger after messenger rushes in with bad news. But the decisive battle is still some scenes away and we don’t yet know if this is a tragedy we are witnessing. Pure shocks came when on June 25, John Dean accused the President of guilt in the Watergate cover-up and on July 16 when former White House aide Alexander Butterfield revealed that Nixon had taped every conversation in the Oval Office. Viewers saw the start to a constitutional crisis when on July 23, the Committee voted unanimously to subpoena Nixon, the first time Congress had served a sitting president, opening the question of whether any man is above the law.107 The hearings were, in MacNeil’s words, “a kind of extended morality play,” in which Americans saw democracy at its worst and at its best and all in prime time. Whitehead submitted his long term funding bill in April 1974 and was furious when in early June, he learned that the President had rejected it. At that point, Nixon wanted to end public broadcasting or give it pittance. Whitehead appealed to Nixon’s chief of staff, writing, “For the President to attempt to back away from that commitment now is unwise, unworkable, and quixotic.”131 In an act of pure frustration, Whitehead leaked the story to The New York Times, which on June 10 published a front page article stating that a source close to CPB claimed that Nixon had “flatly rejected” OTP’s long range funding plan.132 White House Press Secretary Ron Ziegler quickly denied the statement, and on July 16, OTP’s bill was submitted to Congress. Whitehead supplied the letter of transmittal, which stated that after years of successful restructuring, public television was ready for insulated funding.133 On August 7, Whitehead announced his resignation. Nixon resigned two days later.134 OTP’s bill eventually became the Public Broadcasting Financing Act of 1975, which President Ford signed into law on December 31, 1975.135 For the first time since the Public Broadcasting Act of 1967, the system had the funds necessary to ensure its independence. I deeply regret that this situation has arisen, because I think that the Watergate tragedy is the greatest tragedy this country has ever suffered. I used to think that the Civil War was our country's greatest tragedy, but I do remember that there were some redeeming features in the Civil War in that there was some spirit of sacrifice and heroism displayed on both sides. 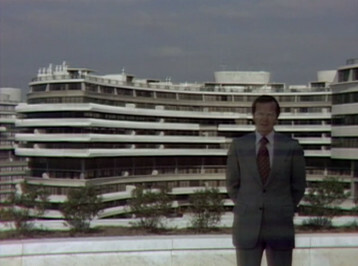 I see no redeeming features in Watergate. What better way to learn from a tragedy than to watch, gavel-to-gavel, how America taught itself a valuable lesson. Special thanks to Allison Perlman for her review of this essay. Joseph Papin. [Television cameras at Senate Watergate hearings], 1973. Prints and Photographs Division, Library of Congress. 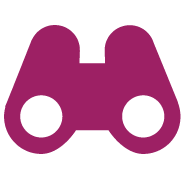 LC-DIG-ppmsca-53333. "Covering Watergate: 40 Years Later With MacNeil And Lehrer (Video)"
"Covering Watergate: 40 Years Later With MacNeil And Lehrer (Transcript)"